« Happy 100th birthday to Hannah Frank! 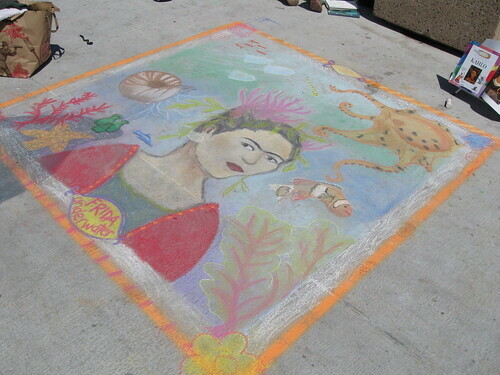 “Frida Underwater” Chalk Art , originally uploaded by pennylrichardsca. Nell and I were part of a Chalk Art Festival at Redondo Pier today–and we won 1st Place in the Family Division! About $100 in gift cards from restaurants, and a whale-watching trip for two (to be used in the winter). Our 6×6 square was titled “Frida Underwater,” and I have to say it was a big crowd favorite. I think we must be in a hundred families’ vacation photos after today. We heard oohs and aahs in various languages; it was especially nice to hear parents take the opportunity to tell their kids about Frida Kahlo being a famous artist from Mexico. But now I’m a little sunburnt, and my left pinkie is on strike. Still, very fun day. We’ll definitely do it again next year. UPDATE: Here we are in the Beach Reporter; here I am in the Daily Breeze, also here. This entry was posted on August 24, 2008 at 12:17 am and is filed under Uncategorized. You can follow any responses to this entry through the RSS 2.0 feed. You can leave a response, or trackback from your own site. Fun! It came out great – congrats on the win. Those sound like great prizes!